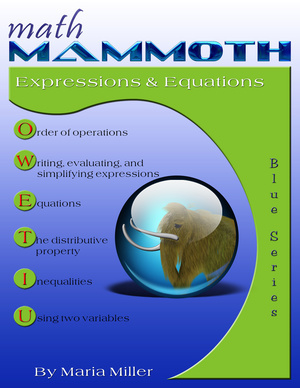 Math Mammoth Expressions & Equations - worktext for grades 6-7. 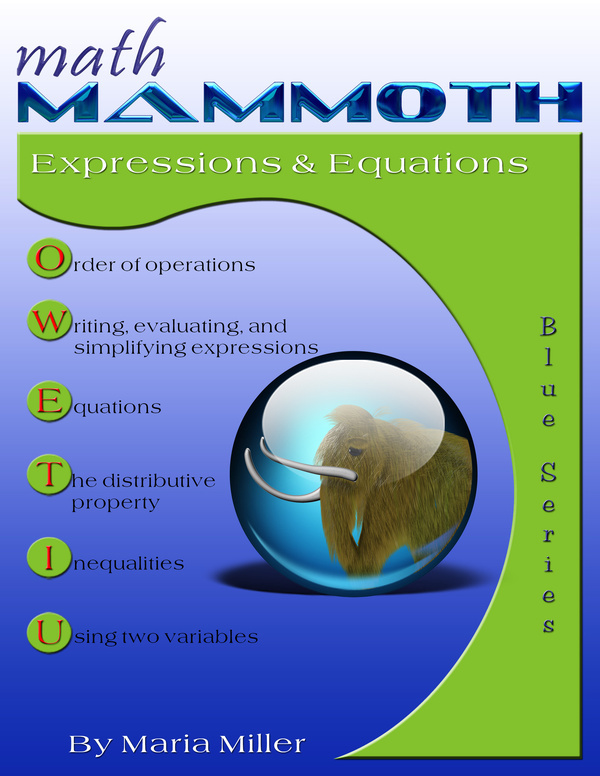 Math Mammoth Expressions & Equations is a worktext covering the order of operations, equations, expressions, and simplifying expressions in several different ways in 6th-7th grade level. We start out by learning some basic vocabulary used to describe mathematical expressions verbally — terms such as the sum, the difference, the product, the quotient, and the quantity. Next, we study the order of operations. Then, we get into studying expressions in definite terms: students encounter the exact definition of an expression, a variable, and a formula, and practice writing expressions in many different ways. In the lesson More On Writing and Simplifying Expressions students encounter more terminology: term, coefficient, and constant. In exercise #3, they write an expression for the perimeter of some shapes in two ways. This exercise is once again preparing them to understand the distributive property. The concepts of equivalent expressions and simplifying expressions are important. If you can simplify an expression in some way, the new expression you get is equivalent to the first. We study these ideas first using lengths — it is a concrete example, and hopefully easy to grasp. Next, students write and simplify expressions for the area of rectangles and rectangular shapes. After that, the lesson Multiplying and Dividing in Parts leads up to the lessons The Distributive Property 1 and The Distributive Property 2, which concentrate on the symbolic aspect and tying it in with area models. After studying Properties of the Four Operations, the next topic is equations. Students learn some basics, such as the solutions of an equation are the values of the variables that make the equation true. They use properties of operations and the idea of maintaining the equality of both sides of an equation to solve simple one-step equations. I have also included a few two-step equations as an optional topic. Lastly, students get to solve and graph simple inequalities, and study the usage of two variables and graphing.